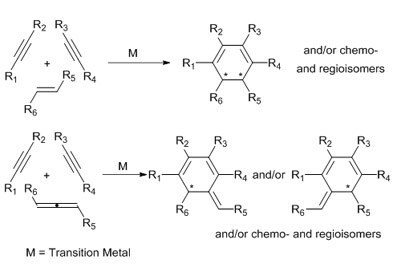 Transition Metals in Organic Synthesis. Expeditious preparation of open-cage fullerenes by rhodium(I)-catalyzed [2+2+2] cycloaddition of diynes and C60: an experimental and theoretical study. Chemistry – A European Journal, 2018, 24, 10653-10661. Chemistry – A European Journal, 2017, 23, 14889-14899. Advanced Synthesis & Catalysis, 2017, 359, 506-512. Advanced Synthesis and Catalysis, 2016, 358, 3512-3516. 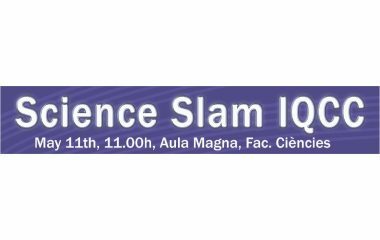 Anna Pla Quintana (Banyoles, 1978) studied Chemistry at the University of Girona (1996 – 2000) and she carried out her PhD studies in the Department of Chemistry at the same university under the supervision of Dr. Anna Roglans. During her doctoral studies, she performed a three-month research-stay at the Queen’s University of Kingston (Canada) under the supervision of Prof. Victor Snieckus. 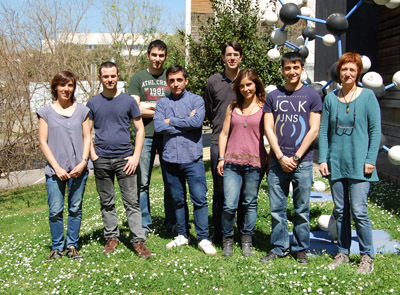 In October 2005 Anna joined the group of Prof. Jean-Pierre Majoral at the Laboratoire de Chimie de Coordination (Toulouse, France) as a postdoctoral researcher within the Fundación Ramon Areces Fellowship program. 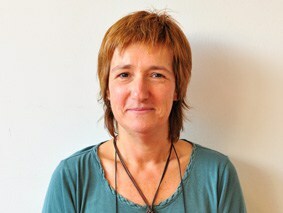 In October 2007 she returned to the University of Girona in the group of Prof. Anna Roglans as a lecturer and got a permanent position in 2009. 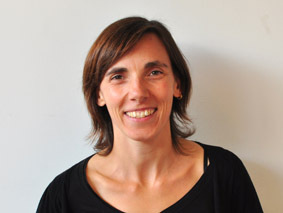 Anna currently leads a research team at IQCC working on the development of transition-metal catalyzed cycloaddition and cyclization reactions, with a special emphasis on the mechanistic studies with the developed procedures. The construction and synthesis of molecular architectures with a high level of complexity and high added value starting from simple products is an important challenge in organic chemistry. Transition-metal catalyzed cyclizations are highly efficient and atom-economical processes that make it possible to access a wide range of carbo- and heterocyclic compounds. Our contribution to this field is based on the study of rhodium-catalyzed [2+2+2] cycloadditions with special emphasis on involving unsaturations, which permit the enantioselective generation of cycloadducts with asymmetric quaternary carbons. Furthermore, we are exploring the use of this methodology for the functionalization of molecular materials for biological, optical and electronic devices. 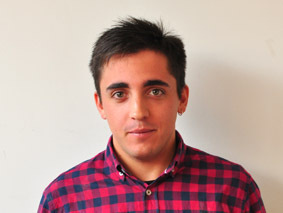 Our aim is also to improve these catalytic processes through a synergy of experimental work and theoretical calculations taking advantage of our membership of the IQCC and our collaboration with Prof. Miquel Solà. We also undertake experimental mechanistic studies intercepting reactive intermediates by electrospray ionization mass spectrometry (ESI-MS). The involvement of alkenes and allenes in transition-metal calalyzed [2+2+2] cycloaddition reactions has the advantage of allowing for the eventual introduction of stereogenic centres in the newly formed six-membered ring and of affording complex polycyclic scaffolds. Our work is focused on the use of properly substituted alkenes, which are more reluctant to react than alkynes, that allow the synthesis of chiral cyclohexadienes and their further functionalization by Diels-Alder reaction. We are also investigating the use of allenes, unsaturated substrates that are more reactive than alkenes and that deliver cycloadducts with an exocyclic double bond that can subsequently be manipulated. 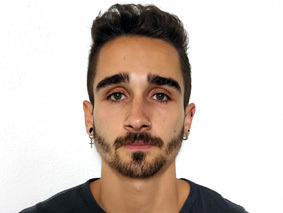 One of the main aims in our research is to control the chemoselectivity and regioselectivity of these processes by determining the factors that govern them both experimentally and theoretically. 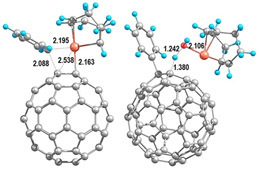 Fullerenes are a class of molecule made up of carbon atoms with an unusual hybridization (sp2,3) exhibiting a chemical reactivity similar to that of electron-deficient olefins. Fullerene, in particular, has received considerable attention due to its interesting spherical structures and unique physical and chemical properties. The functionalization of fullerene with different functional groups provides a variety of potential molecular materials for biological, optical, and electronic devices. Our work is focused on exploring the versatility of rhodium complexes in the cycloaddition of pi-unsaturations to C60 as a tool to functionalize these molecules in a straightforward manner. In order to effectively control and improve the catalytic reactions, it is necessary to understand the mechanistic details of the process. One of the difficulties faced in these investigations is that the low concentrations and transient nature of most of the intermediates involved make their identification difficult. 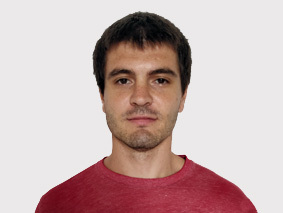 Therefore, techniques that allow the direct monitoring of these reactive intermediates are of great interest. One of our research lines is to use electrospray ionization mass spectrometry (ESI-MS) and subsequent MS/MS analysis to obtain detailed data by trapping and identifying short-lived intermediates in transition-metal catalyzed [2+2+2] cycloaddition reactions. In addition to observing the molecular mass of ions for many reactive intermediates, this technique reveals structural information through characteristic fragmentation patterns by collision-induced dissociation. All these data help us to more fully understand the course of cycloadditions and allow us to improve these reactions. The vast majority of syntheses rely on step-by-step transformations. This is an inefficient, time-consuming strategy that would be greatly improved by the implementation of effective cascade processes. Of the many intermediates that can initiate or participate in cascade processes, metal-carbenoids are an excellent option due to their versatility and high reactivity. 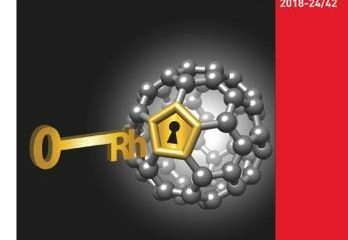 Rhodium(II) dimers have emerged as the most versatile class of complexes for single-step carbenoid mediated reactions. The transition-metal carbenoids that are required for these reactions are mostly prepared from nitrogen extrusion of diazo compounds that have non-negligible security and toxicity risks. Furthermore, the methodology is limited just to carbenoids with certain electronic properties. This research line is aimed at preparing rhodium carbenoids making use of rhodium(I) complexes to decompose arylsulfonylhydrazones, a carbenoid source that is much safer and easier to handle and which is amenable to all types of carbenoids. Rhodium(I) complexes with atropoisomeric ligands are chosen to exploit their versatility and stereoselectivity in cycloaddition reactions, nucleophilic substitutions and rearrangements. This combination is selected to trigger cascade reactions that allow the straightforward enantioselective synthesis of (poly)cyclic compounds from readily available linear starting materials.